I was a casual Star Wars toy collector. But ever since The Vintage Collection debuted, I’ve been finding myself perusing the Star Wars more and more often. In my weakest moments I’m sorely tempted by the AT-AT in retro packaging. But even at my strongest, I couldn’t say no to this Mace Windu. Samuel L. Jackson is awesome. We all know it. He plays the best badass-crazy-mofos in movies and is the only reason any of us paid theater prices to watch a bunch of snakes kill airline passengers. So say what you want about how out of touch George Lucas may be, but at least he recognized Sam Jackson = Awesome Jedi. The only downside to being able to portray a perfect badass-crazy-mofo is that toy sculptors cannot harness the necessary powers needed to craft such features into plastic. It’s true. 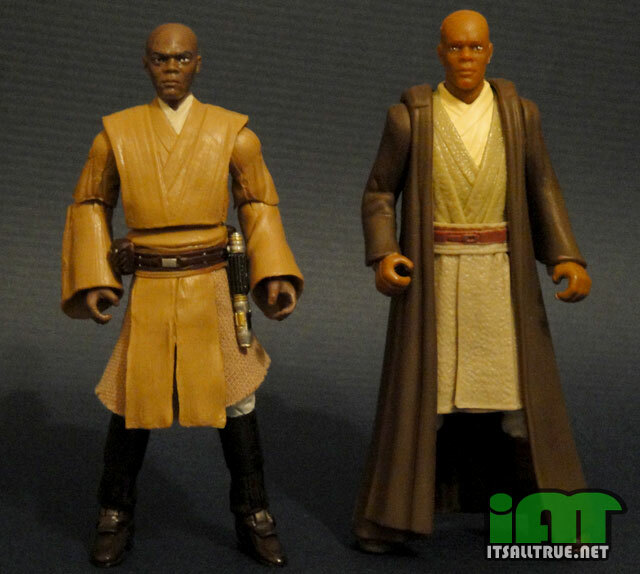 If you don’t believe me then just check out some of the previous Mace Windu figures. At worst you get a toy that looks to either be yawning or having a stroke, at best you get one that looks to be a cosplayer dressed as Mace. It’s all very sad. I can only assume the sculptors at Hasbro have made a blood pact with some sort of unspeakable eldritch horror from beyond. 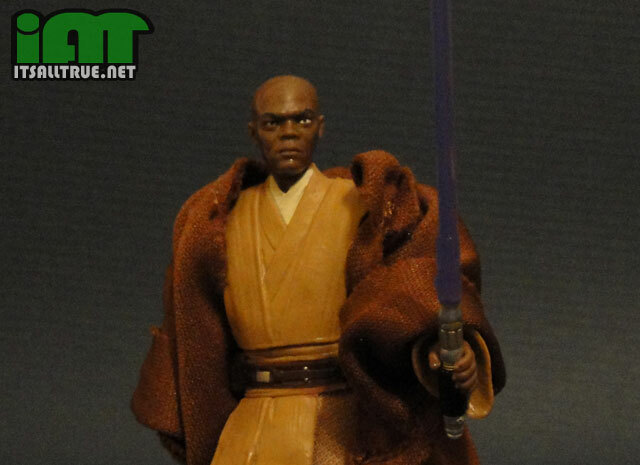 How else can you explain their ability to now craft the perfect badass-crazy-mofo visage in The Vintage Collection’s Mace Windu figure? 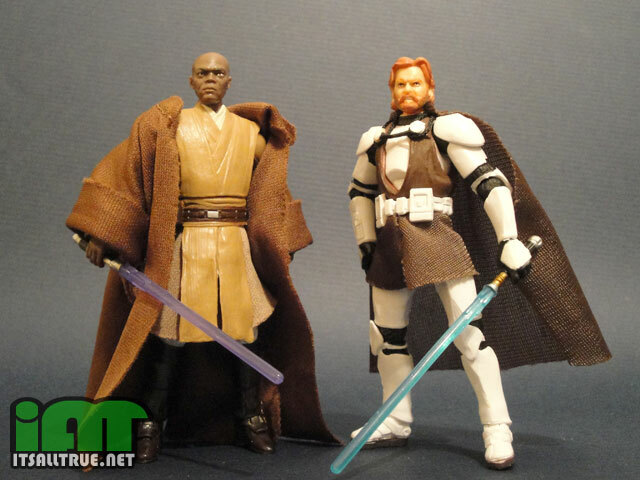 In fact, this isn’t even a Mace Windu figure. 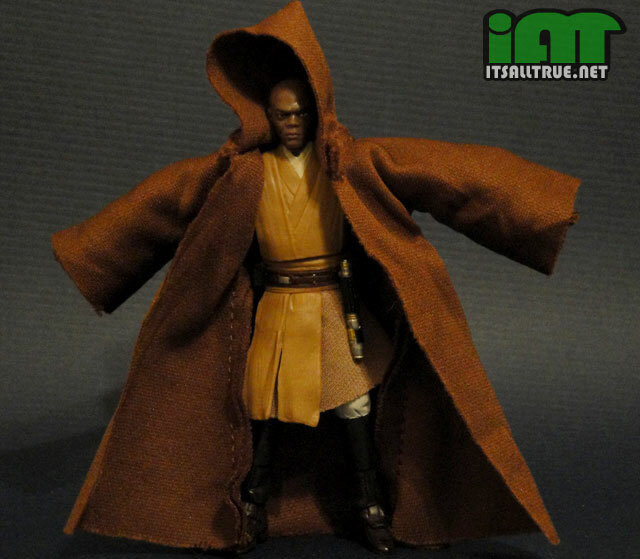 It’s a Samuel L. Jackson figure that happens to be wearing a robe and comes with a lightsaber. And this Sam Jackson toy is definitely not happy. Just look at that slightly furrowed brow and stern mouth. Plus, he’s got crazy murder eyes, with one just slightly larger than the other. Looks like someone just found out who Chancellor Palpatine really is. Sadly, the rest of the figure doesn’t quite live up to the head. The body is the old 30th Anniversary Collection figure. But it has been retooled slightly, making it much improved over the original. They replaced the majority of his skirt with fabric. This gives him a much better range of movement in his legs. They’ve also done a better job of painting the body. The little details like the clasps and buttons on his belt are now silver. His robes are the right color of brown with the white undershirt also painted. Even his boots were painted in a gloss, giving them that shiny leathery feel. Mace has got some decent articulation. His head sits on a ball joint. His shoulders, elbows, waist, knees, and ankles are all swivel hinges. While his wrists and hips are swivel joints. This gives him a pretty good range of movement, especially now that the legs aren’t hampered by a plastic skirt piece. But there are still a couple limiting factors. His hips would have been even more useful if they were also ball joints. Also, the sculpted robes of his upper torso permit his arms from coming together in a natural position. Which kind of stinks, because if you look up any of Sam Jackson’s promo shots for Mace, you’ll notice he almost always holds his lightsaber with both hands. He’s even doing it in the picture they used for the toys package. But it’s just something the figure can’t really pull off. Mace comes with three accessories. There’s a lightsaber hilt that can attach to his belt. There’s his lightsaber with its cool purple beam. Then there’s his cloth Jedi robe. I really like the idea of these fabric robes. Like Grievous’ cape, they can look very dynamic and bring a lot of movement to a posed scene. The problem with this robe is that it is huge. I could kind of work with it. Folding it here and there and rolling up the sleeves helped a bit, but I just could not get that hood to be fashionable. I eventually ended up tucking it behind him, but from the wrong angle he looks like a hunchback now. So, is this figure worth buying? Yes, definitely. He’s worth buying just for the amazing head sculpt alone. Even though the body is a huge improvement over the old mold, I just can’t get him into any natural looking dynamic poses. This isn’t really a bad thing. 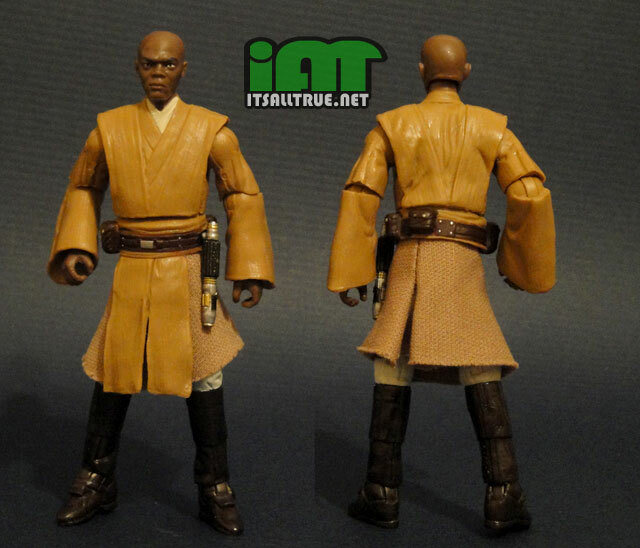 It just means this Mace figure will be posed mostly standing around looking pissed off. That’s entirely acceptable for a Samuel L. Jackson figure. 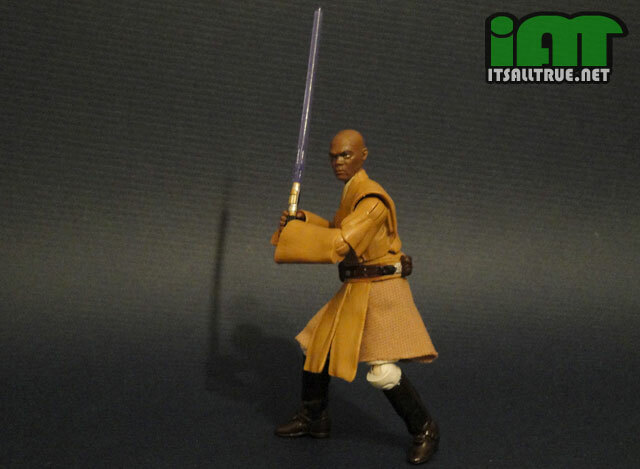 This is the Mace Windu I had been waiting for, ever since i got back into Star Wars just before Attack of the Clones came out in theaters. I apologize for the kind of odd question, but I’m primarily a Marvel Universe and G.I Joe guy. Does this figure possess the nice kind of ball joint head like those tend to, that pops on and off with relative ease? Or is it the meaner kind, like DC Universe where with most figures, they’d break? I am thinking of buying this figure, well, primarily for his soft goods for a custom Jungle-Viper leader, but it’d be nice to be able to use his head for a custom Nick Fury, as even if it comes off with relative ease but lacks in compatibility with either of those two lines, I am sure I could find a nice Star Wars figure to turn into S.H.I.E.L.D armor. Heck, if I can’t work something out, I may just buy this, add the eye-patch and cal him “Asgardian Disguise Nick Fury” but that’s not really keen. Great review, thanks for any possible information, and thank you for the review. Yeah, he’s got one of those ball joint heads that pop off easily. It shouldn’t be a problem to work with for customizing.